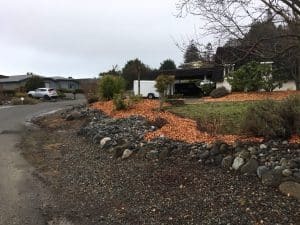 Recently, the Peninsula Urban Forestry crew has been working on several sustainable landscape jobs where we’ve been able to utilize simple, yet extremely beneficial arborist wood chips! What exactly are arborist wood chips? Arborist chips are essentially any material that gets processed through a wood chipper. Arborist wood chips are a by-product of tree work, which includes all parts of the tree (bark, branches, leaves, berries, blooms, etc). By using all parts of the tree, the wood chips help retain and release moisture into the soil. Benefits of using arborist wood chips? 1. Weed suppression. The number one benefit to using arborist wood chips is to suppress weeds. By adding a few inches of wood chip to an area, weed seeds tend not to germinate. This weed suppression is to the natural process of composition. As the wood chips slowly decay, they absorb nitrogen from the surface of the soil, thereby eliminating seed germination. 2. Moisture retention and drought buffering. Wood chips help keep the soil saturated which helps keep plants and vegetation well hydrated. This buffers the damaging effects of Western Washington’s summer-time droughts. 3. Temperature moderation. Wood chips help keep the soil cool and block harsh sun. 5. Soil Amendment and Sustainability. By decomposing slowly, nutrients from the wood chips are released into the soil and offer a diverse environment of organisms, insects and other microbes which help support a long term healthy plant population. 6. The smell! The scent of certain fresh wood chips can be really great. 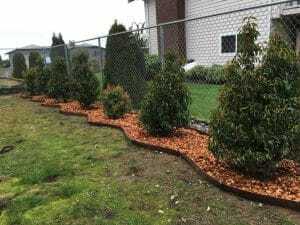 When and how to apply arborist wood chips? Ideally, wood chips should be applied before the annual weeds are established but can really be applied at any time. Spread the wood chips with at least a 2-5 inch depth for ultimate weed suppression. Be careful to not spread fresh arborist wood chip, or any other natural mulch material, within 2-4 inches of a shrub or tree stem. 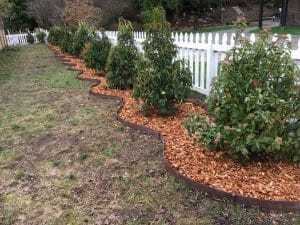 Natural mulch products touching shrubs and trees will cause rot and suffocate plant roots. Other ways to use arborist wood chips? Wood chips can also be used in helping cultivate mushrooms! 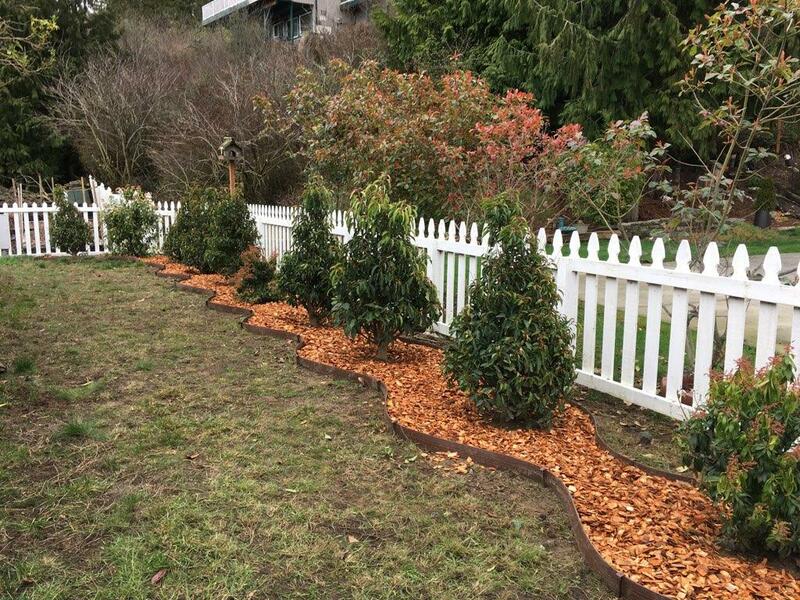 Creating pathways through gardens can also be a great way to use wood chips – easy to walk on and inexpensive. If you’ve got a pup, wood chip material can be a great option for dogs to poop on. Easy clean up! Where to find arborist wood chips? Try local arborists or tree services first. These companies are continuously using their chipper to process material and will most likely have something available. Some companies might charge for dumping chips, while others just might need a spot to dump and you’re next on the list. Call around and see what they offer. Another option would be to check out any landscape/garden material supplier location. 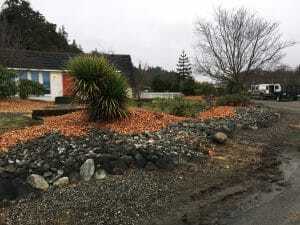 You can also try an online service called ChipDrop (getchipdrop.com), which connects arborists who need to get rid of material with gardeners who are looking to get material. Taryn has a variety of field experience that include work with the Lower Elwha Klallam Tribe on the Elwha River restoration project, conducting wildlife surveys, native plant nursey work, and tree service and pruning work. She has spent 2 years in Washington supervising conservation corps members in trail construction, habitat restoration and invasive species control. Her experience is on both private and commercial landscapes. Taryn is our lead commercial landscaping and irrigation expert and is working towards her ISA Certified Arborist certification and Commercial Pesticide Applicators License. Taryn also has experience in administration, working with the public and outdoor education.